It said that its preferred policy is to continue with the planned adjustment of €3.1 billion. THE FISCAL ADVISORY council has moved to clarify comments made on Prime Time last night by Arthur Spring. Last night, Spring said on the RTÉ programme that the Fiscal Advisory Council had said they were “OK with” the Budget adjustment possibly being changed. The Council said today it “would like to stress that its assessment of the appropriate fiscal stance is unchanged”. 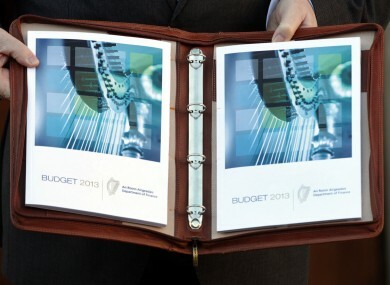 It has previously publicly stated that its preferred policy is to continue with the planned adjustment of €3.1 billion in the upcoming Budget 2014, which will be revealed next Tuesday. Today, the council said it would like to clarify its position on endorsement and assessment in light of public comments “by a Government representative”, meaning Spring, on Prime Time. It said that the council is required under an amendment to the Fiscal Responsibility Act to endorse the macroeconomic forecasts underlying the Budget, but it is not required to endorse the budgetary projections or the fiscal stance. However, under its statutory mandate it does assess the budgetary projections and the fiscal stance in its twice-yearly Fiscal Assessment Reports. The Council endorses “the set of macroeconomic projections prepared by the Department of Finance for Budget 2014 for the years 2013 and 2014 provided to the Council on 30th September 2013″. It said today that it noted Government has announced its intention to implement a smaller aggregate adjustment in the Budget than was assumed in the endorsement process. Despite this, the Council believes the macroeconomic forecasts “remain within the endorsable range”. Email “Fiscal Advisory Council clarifies Spring's Prime Time Budget comments”. Feedback on “Fiscal Advisory Council clarifies Spring's Prime Time Budget comments”.